USA will take a 5-3 lead into the second morning of the Ryder Cup after dominating the afternoon fourballs at the Medinah Country Club. Led by the brilliant partnership of Phil Mickelson and Keegan Bradley and an inspired Bubba Watson and Webb Simpson, the hosts took three of the four points on offer after lunch to open up a commanding advantage. The two teams had been locked together at 2-2 after the morning foursomes, with the Northern Irish pairing of Graeme McDowell and Rory McIlroy picking up Europe's first point and Ian Poulter and Justin Rose providing the second. But with Poulter controversially rested for the better-ball format, along with Luke Donald and Sergio Garcia, Davis Love's side accelerated away as the autumn shadows lengthened. Watson and Simpson thrashed the unhappy pairing of Peter Hanson and Paul Lawrie 5&4, while McDowell and McIlroy were dismantled by the charging Mickelson and Bradley. "Just everybody played real well and hung in there and had a lot of fun. Seemed like as the sun came out, we just got better and better," said US captain Love. With eight more points on offer when the foursomes and fourball formats are repeated on Saturday and 12 during Sunday's singles, the contest is far from over. But captain Jose Maria Olazabal's team will have to produce a major turnaround in order to claim the Cup for the fifth time in seven meetings. "The afternoon was tough," conceded the Spaniard. "That last point [from Nicolas Colsaerts and Lee Westwood] was very important." 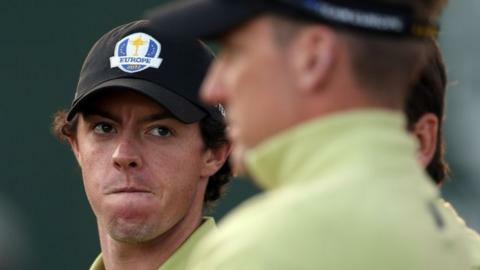 World number one McIlroy agreed with his team leader that the scoreline could have been worse for the Europeans. "The afternoon session wasn't that bad a result, looking at the scoreboard early on in the afternoon," he said. Belgium's Nicolas Colsaerts was an absolute lion and his point with Lee Westwood could be huge come Sunday. In the afternoon the USA putted magnificently and I thought there were moments when Europe looked incredibly down and only Colsaerts looked like he could do anything. Did Europe miss Ian Poulter in the afternoon? They could have had Luke Donald as well but you can always be wise after the event. Europe team captain Jose Maria Olazabal is renowned for delivering inspirational team talks and he needs to deliver an extra special one. "We're only two points behind with eight to play for on Saturday so we're still in a decent position. We're pretty strong on foursomes so if we get a good start in the morning and even things up that would be great. "The atmosphere is incredible. You can feed off the energy but when people are cheering for the other guys you've just got to stay focused. It's definitely nothing like Celtic Manor was a couple of years ago." Olazabal was grateful for the form of Belgian debutant Nicolas Colsaerts, whose wonderful touch with the putter saved his partner Lee Westwood's blushes and brought Europe's only point of the afternoon. "He was amazing," said the Spaniard. "I've heard that's a record score for a rookie in the history of the Ryder Cup so it shows how special his round was." Three years ago Colsaerts was outside the world's top 1,000, not just an outsider for this Ryder Cup but an unthinkable. But eight birdies and an eagle singlehandedly kept his pairing alive, a nerveless 20-footer on the 17th keeping Tiger Woods and Steve Stricker at bay by just a single shot going to the 18th. Woods had a 15-foot putt to win the hole and tie the match but missed it by the tiniest fraction to the left to keep European hopes alive. "I didn't play my best but Nicolas Colsaerts was brilliant to watch," said Westwood, playing in his eighth Ryder Cup. "I tried to support him whenever I could but it was one of those amazing days. We didn't just want the half, it was vital we got the win and the full point." "Nicolas probably had one of the greatest putting rounds I've ever seen," added Woods after losing his first two games for the fourth time in his Ryder Cup career. Watson and Simpson had grabbed their match by the scruff of the neck, going nine-under through the first 10 holes to be six up, and the struggling Lawrie and Hanson could barely dent that lead. Mickelson and Bradley were three up after three against McIlroy and McDowell and went four up after eight, and although they were pegged back to just a two-shot lead on 17 Mickelson then sent his tee-shot on that par three over Lake Kadijah to three feet to seal the 2&1 win. Rose was steady against Matt Kuchar and Dustin Johnson but his partner Martin Kaymer was unable to shake his poor run of form as the European pair went down 3&2 in the fourth fourball. Kuchar and Johnson lost the first hole but produced birdies on every hole from four to seven to take control. Colsaerts saved Europe with a stunning debut. But for the Belgian there would have been an American clean sweep. Woods was on the losing side despite five back-nine birdies and the fact that Colsaerts had next to no help from his experienced partner Westwood. Europe paid a price for benching Poulter. That decision looked ever more questionable as the American-dominated afternoon progressed. Love will feel particularly pleased with Bradley's debut. His two points with Mickelson inspired the home team to a significant lead. With the dew still on the grass and the sun yet to fully rise all four European foursome pairs had briefly led until the fight-back began midway through the morning. Garcia and Donald had won all four of their previous Ryder Cup matches in this format, which sees the players hit alternate shots with the same ball, and were one up after winning the fifth and sixth holes, but Bradley's eight-foot birdie putt on the ninth squared the match. Both European players missed six-foot putts for halves on the 12th and 14th holes, while Mickelson and Bradley holed birdie putts on the 13th and 15th to win four holes on the trot and the first point of this year's competition. McIlroy and McDowell were also one up after six holes and they moved to three up after 11 before Jim Furyk and Brandt Snedeker came back hard with a succession of birdies from 13. It took a loose drive from FedEx Cup champion Snedeker on the 18th to open the door, and a nerveless nine-foot putt from McDowell did the rest. Poulter and Rose took advantage of some poor play in the morning by Woods, who pushed and hooked all manner of shots, to be two up after six holes, despite carding only one birdie themselves. Poulter holed from a greenside bunker on the 11th before knocking in a three-foot putt on the 12th to put the Europeans three up. Woods and Stricker won two of the next three holes but when Stricker's birdie putt on the 17th stayed up and Rose's approach stopped six inches short, the match was conceded. Westwood and Francesco Molinari had been disappointing in their 3&2 defeat to Jason Dufner and Zack Johnson, and veteran Westwood may count himself fortunate to be going back out on Saturday morning.